Calcium mythbuster - can dogs drink milk? Calcium is perhaps best known for giving us healthy bones. But how important is this mineral in your dog’s diet? Our Lead Nutritionist, Dr Samantha Ware, is here with everything you need to know about calcium for dogs. Calcium is an essential mineral for dogs. As well as supporting their teeth and bone health and helping their blood clot properly, calcium helps your dog’s muscles lengthen and contract, and plays an important part in essential processes in your dog’s cells. Which foods are good sources of calcium for dogs? What’s ground bone? It’s tasty bone in a powdered form. This lets your dog get all the nutritional benefits, without any of the risks. Your dog can also get calcium from natural non-food sources, like limestone. This is often where the calcium in calcium supplements comes from. 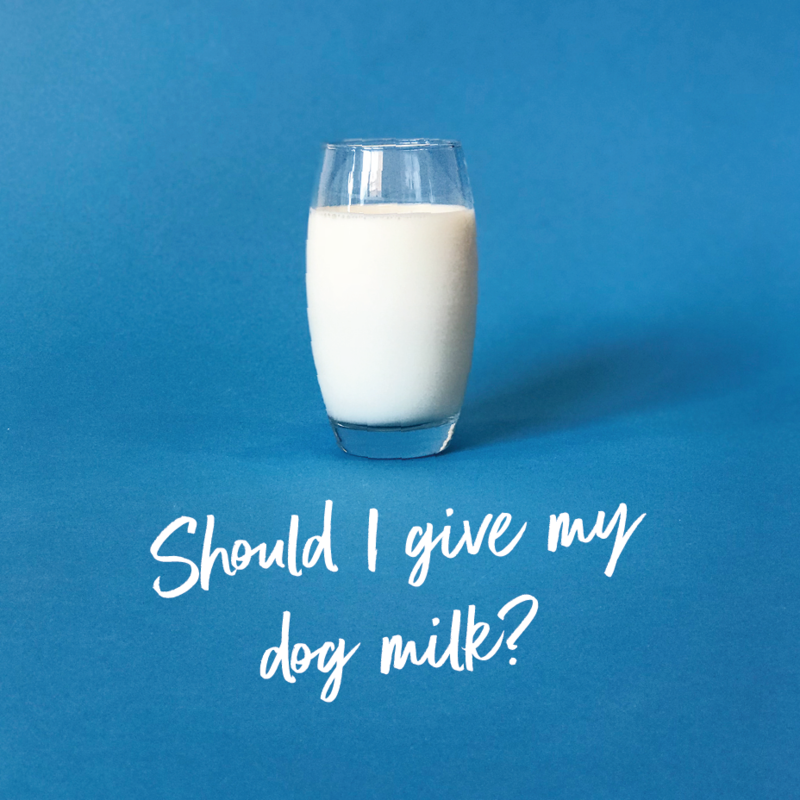 Milk is a good source of calcium for us, but isn’t such a healthy choice for our dogs. That’s because many dogs are lactose intolerant – milk can upset their stomach, give them gas or cause them to bloat. It used to be common for people to give milk to puppies. That can be OK for a while – puppies have the enzymes they need to digest lactose when they’re young, but lose them once they’re older. However, we still don’t recommend giving milk to your puppy. If they never get a taste for this creamy treat, you don’t have to worry about excluding it from their diet later. Does my dog need more calcium? Studies show that large and giant breeds need specific levels of calcium at certain life stages. Factors like breed and life stage also change your dog’s ideal balance of calcium in relation to other minerals, like phosphorus. Working out exactly the right levels for your dog takes some careful calculations. But for tails.com customers it’s sorted in just a few clicks. Once we know your dog’s age, breed and a few other details, we can do all the sums for you in seconds. That means no more worries about whether your dog is getting the right balance. Can I give my dog too much calcium? Too much calcium can cause your dog to develop problems like kidney stones. It can also cause large breeds to grow too quickly for their bones and joints to develop properly. This can lead to problems like hip dysplasia, osteochondrosis and hypertrophic osteodystrophy in adulthood. How much calcium do puppies need? Calcium is an important nutrient for growth and development, so puppies often need more than adult dogs. However, it’s best to avoid giving calcium supplements to a growing puppy. Why? Because puppy foods already contain high levels of calcium. Giving even more can add up to too much. Too much calcium can be harmful to puppies because it affects bone growth and development and can leave your dog with bone density problems. It may also affect how your puppy absorbs other important minerals, like zinc. Another blow to their overall wellbeing. Of course, with a tails.com blend, you can be sure your dog is getting the balance they need. That’s because we work out the right level of calcium for puppies, based on their age, weight, breed, and more. As they get older, grow bigger and move around more, we adjust the calcium level in their food to match. So their blend is equally suitable at every stage of their life. Should I give my dog calcium supplements? Pregnancy – if your dog’s pregnant with a large litter, she may need more calcium to make sure there’s enough to go around. Calcium deficiency – if your dog’s suffering from a significant lack of calcium, a supplement can be a good way to redress the balance. If your dog falls into one of these categories, ask your vet to recommend suitable calcium supplements for dogs. What else does my dog need for healthy bones? Calcium works with phosphorus to support healthy teeth and bones. Levels of these minerals need to be carefully balanced in your dog’s food, because too much of one can stop your dog getting the benefits of the other. Every dog’s tails.com food has the correct levels of calcium and phosphorus to make sure your dog gets the full benefits of both. Want to know more about making sure your dog is getting the right amount of calcium? Our veterinary and nutritionist team is here to help – get in touch at hello@tails.com. Very interesting. …my dogs love about a Table Spoon of milk in the morning….but, on reading this, i may not do this anymore. ….is Hemp Milk any better?…as thats what i have…. thanks for all the great advice, and ideas on this Blog. …fab…. Hi – we have been told (by the breeder) that we should not give cow’s milk to dogs/pups but Goats milk is ok. Our two have thrived on it but only get a small amount daily. Can I give my dog raw egg?